Magic! (stylized as MAGIC!) is a Canadian reggae fusion band, composed of songwriter and record producer Nasri, Mark Pellizzer, Alex Tanas and Ben Spivak. In 2014, they released their debut single, "Rude". Ben Spivak had been playing with the Toronto based Julian Taylor Band previous to joining Magic!, releasing Never Gonna Give You Up in 2012 alongside Julian Taylor on vocal and guitar and Jeremy Elliot on drums. Both had enjoyed success playing in Staggered Crossing with Further Again hitting #6 in 2001 on the Billboard top 100 Canada. Their debut single "Rude" was released on 12 October 2013. The song peaked at number six on the Canadian Hot 100 and also proved a great international success, topping the charts in the United States and the United Kingdom and peaking within the top ten of the charts in Australia, New Zealand, Denmark, the Netherlands and Sweden. "Don't Kill the Magic" was released as the second single from the album on 4 April 2014, peaking at number twenty-two on the Canadian Hot 100 and fifty-three in Australia. The band released their debut album Don't Kill the Magic on 30 June 2014. The album peaked to number 5 on the Canadian Albums Chart and number 6 on the Billboard 200. On December 31, 2014, MAGIC! performed on "New Year's Rockin' Eve" at Times Square in New York City. They wore matching yellow suits and stood with Taylor Swift and Ryan Seacrest as the ball dropped. The band will open several shows in North America and Europe for Maroon 5's Maroon 5 World Tour 2015. MAGIC! is featured on Shakira's "Cut Me Deep", a track from her self-titled album, released in March 2014 and on a track on One Love, One Rhythm, the official 2014 FIFA World Cup album titled "This Is Our Time (Agora é a Nossa Hora)" released in April. 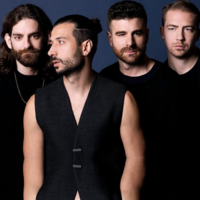 They are also featured on "Sun Goes Down", a track on David Guetta's album Listen, which also features Sonny Wilson on the hook, as well as production from Showtek.